We received an email from L.L. 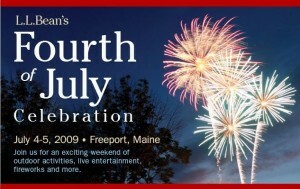 Bean today, reminding us of their giant July 4th celebration, taking place here in Freeport, on July 4 and continuing on July 5. 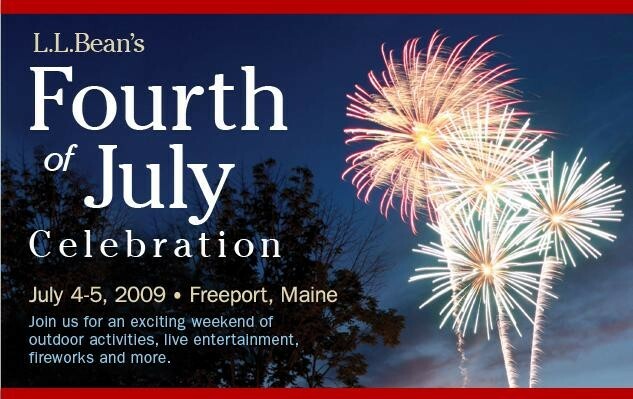 This is a great event every year, from the morning parade put on by the town of Freeport (we all gather on the front lawn, as it goes right past the front of Brewster House), to the sidewalk sales and other events, free concerts at L.L. Bean (Patty Loveless is on Saturday night, July 4), followed by a huge (and we do mean huge) fireworks show. It is a fun time for all! That brings to mind several other events that are coming up in the area. The first concert in L.L. Bean’s 2009 Summer Concert Series (all concerts are free) is this weekend as Madeiline Peyroux appears in L.L. Bean’s Discovery Park in Freeport. The concerts continue every Saturday night through Labor Day. Meanwhile, the highly acclaimed Maine State Music Theatre is presenting “Crazy for You” through July 11, followed by “Dirty Rotten Scoundrels” which begins July 15. Dan Zanes and Friends appear in the L.L. Bean Summer Concert Series on July 11, Matt Dusk on July 18, and Punch Brothers featuring Chris Thile on July 25. Meanwhile, Brewster House and the other Historic Freeport Bed and Breakfasts‘ monthly Open House is from 2 p.m. – 4 p.m. on July 17.